The railway system across the United States has been important for transportation of freight and people since the early 1800s. The trains did not run by themselves but always needed railroaders to maintain and run them. Many people over the decades had as their occupation something having to do with the railroads. Using the online site, Railroaders Memorial Museum, they have a section referred to a ‘Call Board Database‘. There are over 18,800 entries about railroad personnel in this database. It originally was only searchable at the Museum, but is now online. The Museum has been collecting information, especially donated by the families of railroaders over the years. 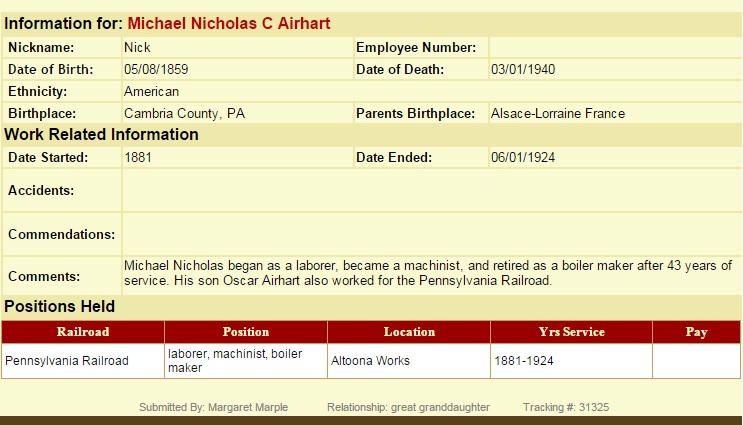 If you have an ancestor who worked at any time in any location in the United States on the railroad system, check what is in the database. If you do not find that ancestor or have more to add to one already listed, you can do so on the site. The person’s name, birth date, what jobs, locations and years they worked for the railroad along with any unusual happenings can be included. 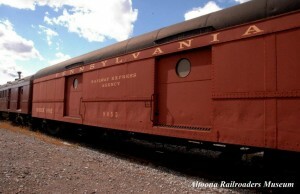 This Railroaders Memorial Museum is in Altoona, Pennsylvania. This area in the 1920s employed 15,000 railroad workers and by 1945 the Pennsylvania railroad facilities in Altoona was the largest rail shop complex. In using the Call Board, located at the bottom of the page, click on it. Then you can select to search for a railroader or view at random as of the railroaders on the list. At the bottom, you can select this section if you have information for a new entry for your own ancestor. It is easy to add the information and then it is submitted for approval and you are notified when accepted. 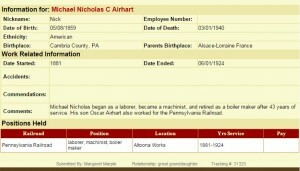 It is a great database to see what is on record about any ancestor you think might have been working on the rail system. Best part, you can add information so it is a permanent part of the museum. Photos: Museum in Altoona and an entry for Michael Airhart.